Here is the list of the hotels near Fournès. Book your hotel near Fournès today, Friday 10 May for the best price, reservation and cancellation free of charge thanks to our partner Booking.com, leader in on-line hotels reservation. Below here is the list the 50 closest hotels of Fournès, sortable according your criteria. You will find the position of these accommodations on the Fournes hotels map. Maison De Vacances - Fournès is set in Remoulins and offers barbecue facilities, a garden and a terrace. The accommodation is 8 km from the Pont du Gard. The villa has a TV and a living room. The accommodation is fitted with a kitchen with a dishwasher and an oven. A bicycle rental service is available at this property. The nearest airport is Avignon-Provence Airport, 29 km from the villa. Situated in Fournès, Maison De Vacances - Fournes offers accommodation with a private pool. Guests staying at this villa have access to free WiFi and a fully equipped kitchen. Opening onto a terrace, the villa consists of 4 bedrooms. A TV and a DVD player are available. The villa offers an outdoor pool. A barbecue can be found at Maison De Vacances - Fournes, along with a garden. Avignon is 21 km from the accommodation. The nearest airport is Avignon-Provence Airport, 29 km from Maison De Vacances - Fournes. Les Acanthes is situated in the medieval town of Remoulins, only 4 km from the Roman aqueduct Pont du Gard, a UNESCO heritage site. It offers traditional cuisine at the hotel restaurant and access to a shady garden and terrace. Each individually decorated room has a separate bath or shower, air-conditioning and a flat-screen TV. Solar energy is used for hot water and free Wi-Fi is available. Hotel Les Acanthes is a 25-minute drive from Avignon or Nîmes. Free private parking is provided, as well as bicycle storage space. Featuring a restaurant, Auberge de Guigare is located in Sernhac. Free WiFi access is available. The guestrooms offer views of the garden, a flat-screen TV, and a coffee machine. The private bathroom has a shower. All rooms have air conditioning. The on-site restaurant features local dishes and fresh products grown at the property. Special diet menus and packed lunches are also available. At Auberge de Guigare you will find a garden and a terrace. The property offers free parking. Set in Remoulins, Les Glycines has a terrace, bar and free WiFi. The property is situated 3.7 km from Pont du Gard. Guests can enjoy a selection of French cuisine in the in-house restaurant. Free bicycle storage is available. At the hotel, each room is fitted with a wardrobe. Each room has a private bathroom. At Les Glycines, rooms include air conditioning and a TV. A buffet breakfast is served each morning at the property. Cycling and hiking are among the activities that guests of the accommodation can find nearby. The nearest airport is Avignon-Provence Airport, 31 km from Les Glycines. Set in the centre of Remoulins, this bed and breakfast is set in a 19th-century bourgeois house with an adjoining tower, which dates from the 12th century. It offers free Wi-Fi access and 2 lounges. Some of the rooms and suites at Bize de la Tour are decorated in a Louis 13th –style, while others are inspired by the 1900s. Each one has antique furniture and views of the 12th-century tower or the village. A continental breakfast is provided every morning under the original wooden beams in the dining room. You can also enjoy breakfast on the interior courtyard’s terrace, which is inside one of the old towers. A selection of books in the library is just some of other facilities in this B&B. With free private parking on site, Uzes is just 15 km away, while Avignon and Nîmes are both 20 km from the property. Featuring a garden and a shared living area with a library, board games and DVDs, Guesthouse de Cambis B&B is located in the centre of Remoulins. Free WiFi access is available. The suites offer access to a fully equipped kitchen with a refrigerator and a microwave. The private bathrooms have a bath or shower and come with a hairdryer and free toiletries. You can enjoy a garden view from some rooms. The family suite also comes with a Wii game console. Cambis is 2.1 km from Pont du Gard. Marseille Provence Airport is 77 km away. The property offers free parking. Situated in Théziers, Holiday home Chemin De Terra Brune offers accommodation with a private pool, free WiFi and private parking. Guests can go for a swim in the outdoor pool. The holiday home includes 3 bedrooms, a kitchen with a microwave and a fridge, as well as a coffee machine. Avignon is 21 km from the holiday home. The nearest airport is Avignon-Provence Airport, 31 km from the property. Situated in Castillon-du-Gard in the Languedoc-Roussillon region, les croisées provides accommodation with free WiFi. Some units have a seating area and/or a balcony. A continental breakfast is available daily at the bed and breakfast. Les croisées offers an outdoor pool. Guests can also relax in the garden. Avignon is 24 km from the accommodation, while Nîmes is 29 km away. The nearest airport is Avignon-Provence Airport, 32 km from the property. Set in Montfrin, Maison De Vacances - Montfrin offers a private pool. Guests have a private terrace. The villa comes with 2 bedrooms, a TV and a fully equipped kitchen that provides guests with a dishwasher. The villa offers an outdoor pool. Maison De Vacances - Montfrin features a children's playground. Avignon is 27 km from the accommodation. The nearest airport is Nimes-Ales-Camargue-Cevennes Airport, 31 km from Maison De Vacances - Montfrin. Set on a 600 m² garden, Le Mazet is a 3-minute drive from the centre of Remoulins and 17 km from Uzès. This Provencal-style stone cottage offers free Wi-Fi access and a terrace with outdoor furniture and forest views. This cottage includes 1 bedroom with a four-poster bed and a living room with a flat-screen TV and a DVD player. The bathroom is complete with a shower and a bath. The kitchen has kitchenware, a microwave and a fridge. A toaster, a coffee machine and a barbecue are also provided. Le Mazet is 24 km from Avignon and 5 km from the A9 motorway. Guests staying for 1 week or more can make use of the laundry facilities once a week. Located in Remoulins within a 600m² garden, Chez Jean-Pierre & Annick offers proposes a self-catering cottage with a goldfish pond. Avignon is just 20 km away. The cottage features a living room with a flat-screen TV, DVD player and iPod docking station, a shaded terrace and BBQ facilities upon request. The kitchen is equipped with a stove, microwave and refrigerator. Grocery shops and restaurants are ideally located 800 metres away and Le Pont du Gard is a 5-minute drive away. Free Wi-Fi access is available throughout and free private parking is possible on site. La Combe Joseph is a 4-minute drive from the centre of Remoulins and 5 km from the A9 motorway. It offers free Wi-Fi access, a seasonal outdoor swimming pool and a terrace with lounge beds. All rooms feature a flat-screen TV, a private terrace and a private bathroom with a bath or shower. They provided direct access to the swimming pool. Guests are invited to enjoy breakfast every morning at La Combe Joseph. Evening meals are also served on request. Restaurants can be found within 800 metres of the property. This B&B is 18 km from Uzès and 24 km from Avignon. Free private parking is available on site. Gîte du Flamant Gris is situated in Montfrin. This holiday home also features free WiFi. This air-conditioned holiday home features 2 bedrooms, a flat-screen TV, a dining area, and a kitchen. The accommodation also features 1 bathroom with a shower and a washing machine. Avignon is 27 km from the holiday home, while Nîmes is 25 km away. Nimes-Ales-Camargue-Cevennes Airport is 31 km from the property. Guest accommodation Saint-Bonnet-du-Gard Preferred hotel ! Located in Saint-Bonnet-du-Gard, the Villa des Figuiers offers a garden and a swimming-pool and is a 30-minute drive to Nîmes. Le Pont du Gard, an ancient Roman aqueduct bridge, is an 8-minute drive from the property. Villa des Figuiers features 2 superior double room, a triple room, a deluxe suite and a two-bedroom apartment with a garden view, bathrooms with a shower and free WiFi. A continental breakfast is served daily. The property is a 7-minute drive from Lédenon and a 5-minute drive from Remolins. The Nîmes train station is only 25 km away. Featuring accommodation with a terrace, La Petite Maison De Velina is set in Sernhac. The accommodation is 28 km from Avignon. The holiday home is equipped with a TV. A dishwasher and an oven can be found in the kitchenette. Nîmes is 19 km from the holiday home, while Arles is 34 km from the property. Nimes-Ales-Camargue-Cevennes Airport is 33 km away. Featuring a terrace, La Maison De Vélina offers accommodation in Sernhac with free WiFi and city views. The accommodation is 28 km from Avignon. The bed and breakfast comes with a satellite flat-screen TV. A continental breakfast is available every morning at the property. Nîmes is 19 km from the bed and breakfast. Nimes-Ales-Camargue-Cevennes Airport is 33 km away. Located 1.2 km from Pont du Gard in Remoulins, Lieu dit La Couasse offers accommodation with a kitchenette. The property features mountain views. The apartment has a TV and a living room. The apartment offers an outdoor pool. The nearest airport is Nimes-Ales-Camargue-Cevennes Airport, 23 km from Lieu dit La Couasse. Set in Sernhac, Les Aires Passagères has a seasonal outdoor swimming pool and barbecue facilities. With a garden, the property also features a terrace, as well as a shared lounge. Both free WiFi and private parking are accessible at the guest house. At Les Aires Passagères, every room is fitted with a wardrobe. Every room includes a private bathroom with a shower and free toiletries. Guest rooms at the accommodation come with a seating area. Breakfast is available daily, and includes continental, vegetarian and gluten-free options. Les Aires Passagères offers a children's playground. The area is popular for hiking, and bike hire is available at this 3-star guest house. Avignon is 28 km from the guest house, while Nîmes is 19 km away. The nearest airport is Nimes-Ales-Camargue-Cevennes Airport, 33 km from Les Aires Passagères. Set in Castillon-du-Gard, Fontaine de Cérier features accommodation with an outdoor pool, a garden and a terrace. Complimentary WiFi is offered. An Italian, vegetarian or gluten-free breakfast is available daily at the property. Avignon is 25 km from the bed and breakfast, while Nîmes is 29 km away. Avignon-Provence Airport is 33 km from the property. Surrounded by gardens, this hotel features a seasonal swimming pool and is located 200 metres from the entrance to the site of the Roman aqueduct, Le Pont du Gard. Guests are invited to dine 'al fresco' on the terrace. A flat-screen TV, air conditioning and en suite bathroom facilities are provided in each of the rooms at Le Colombier. Some rooms feature free Wi-Fi access and open up onto a terrace. Breakfast is served each morning inside or on the terrace. The hotel has a bar, and the restaurant proposes traditional meals prepared with products from the region. Two free, private car parks are available on site and the Remoulins Train Station is 2.5 km from the hotel. Avignon is reached by car in 30 minutes and the city of Nimes is 30 km away. The "Domaine des Escaunes" is located in the middle of the triangle Avignon-Nîmes- Uzes. This ancient Post relay is situated at the exit of the village "Sernhac" surrounded by 7 hectares of vineyards and olive trees. The traditionally decorated rooms have a private bathroom with bath or shower and private toilet. Some of the rooms offer air conditioning and views of vineyards or the Provençal countryside. A beautiful, elegant ancient post relay tastefully renovated. 3 differents wings between the 16th and the 19th century, surface of 2000 m². The property boasts a walled garden, swimming pool (8mX18m), pool house, terraces and secured parking with a code. La Belle Vie is located in a charming 18th-century house in the small village of Saint-Hilaire-d'Ozilhan. Elegant rooms, a garden with olive trees and an outdoor swimming pool with sun beds are available in this B&B. Each room at La Belle Vie includes a private bathroom with a bath or a shower, hairdryer and free toiletries. Provided with free Wi-Fi, they provide tea and coffee making facilities, an LCD TV and a seating area or a terrace. Pastries and homemade jams are offered for breakfast and refined meals are prepared upon reservation. Avignon TGV Train Station and Nîmes are 20 km away and the Pont du Gard is an 11-minute drive away. A taxi partner company provides reduced fares and free private parking is available on site. Offering free WiFi and pool views, Villa Rue du 19 Mars 1962 is an accommodation set in Montfrin. The air-conditioned accommodation is 28 km from Avignon. The villa has 3 bedrooms, a TV with satellite channels and a fully equipped kitchen that provides guests with a dishwasher. The villa offers an outdoor pool. Barbecue facilities are provided. Nîmes is 24 km from Villa Rue du 19 Mars 1962, while Arles is 30 km from the property. The nearest airport is Nimes-Ales-Camargue-Cevennes Airport, 30 km from the property. Featuring an outdoor pool and a children's playground, Camping la Sousta**** is located in Remoulins. This camping offers direct access to the river, table tennis and a tennis court on site . The accommodations feature a terrace and a seating area.There is a full a kitchenette with a microwave and a refrigerator. The private bathroom comes with a shower. At Camping la Sousta**** you will find a restaurant, a bar and BBQ facilities. An array of activities can be enjoyed on site or in the surroundings, including cycling, fishing and hiking. The property is 1 km from Pont du Garde, 18 km from Uzès and 24 km from Nîmes and from Avignon. Free parking is available. Located in Castillon-du-Gard, Les Petits Gardons offers accommodation with free WiFi. Each unit offers a fully equipped kitchen, a flat-screen TV with satellite channels, a living room, a private bathroom and a washing machine. A dishwasher is also offered, as well as a coffee machine and a kettle. At the villa guests are welcome to take advantage of an indoor swimming pool. Guests can go cycling or relax in the garden. Avignon is 26 km from Les Petits Gardons, while Nîmes is 30 km from the property. Avignon-Provence Airport is 33 km away. Bed and Breakfast Meynes Preferred hotel ! Mas De Martinet offers B&B accommodation, a garden, an outdoor swimming pool, a terrace, a bar and a restaurant. The property is 8 km from Pont du Gard and Nîmes TGV Train Station is 20 km away. The rooms at Mas De Martinet feature a TV, air conditioning, individual heating, and a wardrobe. The private bathrooms include a bath tub or a shower. A continental breakfast is served daily and you can also enjoy homemade meals prepared by the hosts. This service is available upon request. Mas De Martinet is 25 km from Avignon Train Station, and there are restaurants and supermarkets within 8 km of the property. Holiday home Chemin du Jas des Vaches is located in Domazan. Guests staying at this holiday home have access to a fully equipped kitchen. The holiday home features a TV. The holiday home offers an outdoor pool. Avignon is 16 km from Holiday home Chemin du Jas des Vaches, while Nîmes is 31 km away. The nearest airport is Avignon-Provence Airport, 23 km from the property. Set in Saint-Hilaire-dʼOzilhan, Ferienhaus mit Pool Saint Hilaire d'Ozilhan 100S offers a private pool and free WiFi. Guests staying at this holiday home have access to a fully equipped kitchen. Avignon is 25 km from the holiday home, while Nîmes is 29 km away. Avignon-Provence Airport is 32 km from the property. Petit Appartement Pont du Gard offers accommodation in Castillon-du-Gard, 21 km from Avignon and 20 km from Nîmes. The property boasts views of the Pont du Gard, and is 31 km from Arles. Free WiFi is available throughout the property and free private parking is available onsite. A microwave, a toaster and a fridge can be found in the kitchenette and there is a private bathroom with bathrobes and free toiletries. A flat-screen TV is provided. A 25m² private terrace is also featured, on which you can enjoy your meals Bike hire is available at the property and the area is popular for horse riding and cycling. Orange is 29 km from Petit Appartement Pont du Gard, while Saint-Rémy-de-Provence is 29 km from the property. A number of activities are offered in the area, such as canoeing and hiking. The nearest airport is Nimes-Ales-Camargue-Cevennes Airport, 24 km from the property. Bed and Breakfast Castillon-du-Gard Preferred hotel ! Guest accommodation Castillon-du-Gard Preferred hotel ! Set on the banks of the River Gardon, these air-conditioned apartments include free Wi-Fi access and the tree-lined garden features a swimming pool. Pont du Gard Bridge is 800 metres away and Uzès is a 10-minute drive from the motel. A flat-screen TV is provided in each soundproofed apartment. Wooden furnishings and tiled flooring are features in the apartments, and each one has a furnished patio. Breakfast is available at a supplement and upon prior reservation. The kitchenettes at Le Clos De La Cerisaie are equipped with a microwave, coffee maker and a fridge. There are also dining and seating areas. Nîmes and Avignon are a 20-minute drive from the Motel Le Clos De La Cerisaie and free private parking is available on site. Remoulins Train Station is 1.5 km away. Set in Castillon-du-Gard, Gîtes Lackocote provides accommodation with an outdoor pool and barbecue facilities. Complimentary WiFi is available. All of the units feature a private bathroom, living room, flat-screen TV, fully-equipped kitchen and terrace. A dishwasher and oven are also featured, as well as a coffee machine and a kettle. Guests can relax in the garden at the property. Avignon is 27 km from the holiday home. Avignon-Provence Airport is 34 km away. Camping Bellerive is a 2.5 hectare camping ground located in Montfrin on the Gordon River, just 25 km from the Avignon TGV Train Station. You can eat at the snack bar or use the on-site washing machine facilities. Each accommodation includes a kitchen with a refrigerator, sink, stove and dishes. You can relax in the living area or outside in the seating area. In some accommodations air conditioning is possible. In Montfrin, there is a supermarket a 15-minute walk away and a local market every Tuesday morning. You can prepare meals in the kitchen in your accommodation. During Euro 2016, matches could be watched at the camping's restaurant. The Pont du Gard is 15 km away from Camping Bellerive. On site you can play pétanque, table tennis and beach volleyball. There is also a possibility to rent a canoe or go fishing. Situated in Castillon-du-Gard, Moulin de maître Cornille features accommodation with a private pool. Free WiFi is featured. This holiday home features a living room and a fully equipped kitchen with a dishwasher. A flat-screen TV is provided. The holiday home offers an outdoor pool. This property offers a terrace. Avignon is 27 km from Moulin de maître Cornille, while Nîmes is 31 km away. The nearest airport is Avignon-Provence Airport, 34 km from the accommodation. La Signargue features a seasonal outdoor swimming pool, BBQ facilities, a garden and terrace in Domazan. All rooms feature a kitchen and a private bathroom. Free WiFi is included. At the guest house, every room is fitted with a patio. Rooms come with air conditioning and a flat-screen TV, and certain units at La Signargue have pool view. All units are equipped with a seating area. The accommodation offers a children's playground. Guests at La Signargue will be able to enjoy activities in and around Domazan, like hiking. Avignon is 12 km from the guest house, while Nîmes is 27 km away. The nearest airport is Avignon-Provence Airport, 21 km from the property. Guest accommodation Montfrin Preferred hotel ! Gîtes la Tarente offers self-catering accommodation in Montfrin, 22 km from Avignon, and 23 km from Nimes. Free WiFi access is available in all the holiday homes. The holiday homes feature a TV and a terrace. There is a fully equipped kitchen with a microwave and an oven. The private bathroom has a shower and a hairdryer. An array of activities can be enjoyed on site or in the surroundings, including cycling and hiking. Bikes can be borrowed onsite. The Pont du Gard is 15 km away and the nearest airport is Marseille Provence Airport, 97 km away from Gîtes la Tarente. Free public parking is available nearby. 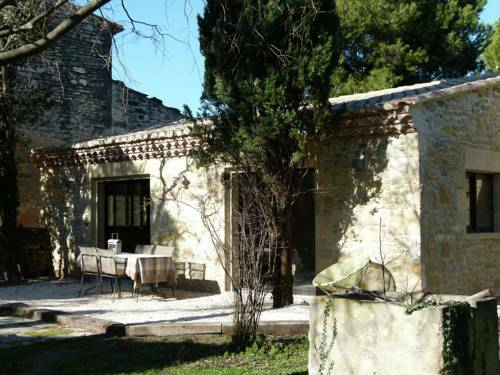 Offering a barbecue and views of the garden, La Siesta Andalouse is situated in Castillon-du-Gard in the Languedoc-Roussillon Region, 20 km from Avignon. Some rooms have a seating area where you can relax. You will find a coffee machine in the room. Guests also have access to a communal kitchen. Guests can enjoy various activities in the surroundings, including golfing and horse riding. The guest house also offers bike hire and car hire. Nîmes is 21 km from La Siesta Andalouse, while Arles is 33 km away. The nearest airport is Avignon-Provence Airport, 29 km from La Siesta Andalouse. Situated in Montfrin, Le Patio Guest House provides accommodation with private terraces. All rooms boast a kitchen and a private bathroom. The in-house restaurant serves French cuisine. At the guest house, each room has a wardrobe and a flat-screen TV. Le Patio Guest House features certain rooms with garden views, and every room comes with a kettle. The rooms will provide guests with a fridge. Bike hire and car hire are available at this guest house and the area is popular for cycling. Avignon is 23 km from the accommodation, while Nîmes is 23 km away. The nearest airport is Nimes-Ales-Camargue-Cevennes Airport, 29 km from the property. Featuring a garden and free WiFi, locastillon offers accommodation in Castillon-du-Gard. Providing a terrace, particular units are air conditioned and feature a dining area and a seating area with a flat-screen TV. A microwave and kettle are also offered. A continental breakfast can be enjoyed at the property. Hiking can be enjoyed nearby. Avignon is 27 km from the bed and breakfast, while Nîmes is 32 km away. The nearest airport is Avignon-Provence Airport, 35 km from the property. Apartment Montfrin Preferred hotel ! Le Vieux Castillon is located in the heart the small medieval village of Castillon-du-Gard, a 35-minute drive from Nîmes and Avignon. The famous Pont du Gard is 3.5 km away. The hotel offers an heated outdoor pool with a view of the nearby area and a spa. This property has 33 rooms, split across 2 buildings. The main building offers 21 rooms, all renovated in 2015. The annex building features 13 rooms which were all renovated in April 2017. All the rooms are fitted with all the modern comfort including air conditioning, satellite television, a minibar and a coffee machine. The restaurant is decorated with imposing wooden beams and offers refined cuisine with regional accents. There are many patios and terraces for guests to enjoy. The property is a 50-minute drive from Avignon - Caumont Airport. Guest accommodation Lédenon Preferred hotel ! Located 1.5 km from the centre of Lédenon, La Lune ô Collines offers self-catering accommodation with access to an outdoor swimming pool and 3 lagoons. The property offers free Wi-Fi throughout. The houses are equipped with a fully equipped kitchen and seating area. Each accommodation has a private bathroom with a shower. La Lune ô Collines is situated 5 km from Remoulins Train Station. Avignon Airport can be reached in 45 minutes by car. 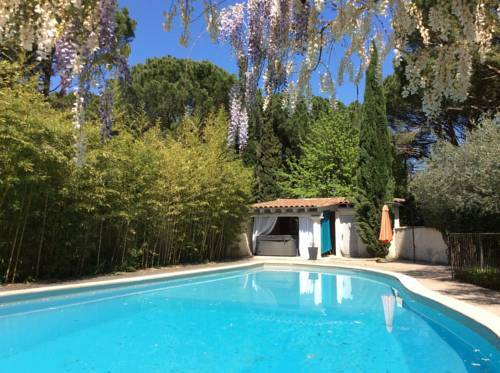 ENTRE AVIGNON et PONT DU GARD in Rochefort-du-Gard features a seasonal outdoor swimming pool and a garden. Facilities include a terrace and free WiFi is available. The guest room has air conditioning, a microwave, a fridge, a kettle, a shower, free toiletries and a desk. The private bathroom is fitted with a hair dryer. The room is fitted with a wardrobe. The double bed is situated on the mezzanine level and is accessed by a wooden ladder. Guests at the bed and breakfast can enjoy a continental breakfast. Avignon is 11 km from ENTRE AVIGNON et PONT DU GARD, while Nîmes is 28 km away. Avignon-Provence Airport is 20 km from the property. Guest accommodation Saze Preferred hotel ! Boasting air-conditioned accommodation with a terrace, La Grange is set in Saze. Featuring pool views and a garden, this holiday home also features free WiFi. The holiday home is fitted with 4 bedrooms, a fully equipped kitchen with a dishwasher and an oven, and 3 bathrooms with a bath and a hair dryer. A flat-screen TV is offered. The holiday home offers an outdoor pool. This property offers a barbecue. Avignon is 13 km from La Grange, while Nîmes is 33 km away. The nearest airport is Avignon-Provence Airport, 21 km from the property. Situated in Lédenon in the Languedoc-Roussillon region, Gite les Coquelicots has a garden. The property features garden views. This air-conditioned holiday home comes with 1 bedroom, a flat-screen TV, a dining area, a kitchen with a dishwasher, and a living room. The holiday home also includes a seating area and 1 bathroom with a shower. The holiday home offers a terrace. Avignon is 28 km from Gite les Coquelicots, while Nîmes is 17 km away. The nearest airport is Nimes-Ales-Camargue-Cevennes Airport, 31 km from the accommodation. Located in Saze, Esprit Zen features accommodation with a flat-screen TV. Complimentary WiFi is featured. A terrace with garden views is offered in each unit. The apartment offers a barbecue. Guests at Esprit Zen can enjoy hiking nearby, or make the most of the garden. Avignon is 13 km from the accommodation, while Nîmes is 33 km away. The nearest airport is Avignon-Provence Airport, 21 km from the property. Below here is the hotels map of Fournès. Names and details of Fournès hotels can be shown on the map clicking on the prices icons.